At last! I have waited a long time for this. The Char B has always been my favorite Tank. Back in the dark ages (the seventies) I would watch each 1/35th Tamiya release, waiting for the big beastly Char. No luck. My (more skilled than I) brother went so far as to scratchbuild one, in about 1/25th scale. It was gorgeous, with it's Bud can fenders and pencil/lathe turned 75mm. But it wasn't mine and it wasn't Tamiya. Fast forward to 2006. When I saw Tamiya was going to release my long lost favorite, I was thrilled. I made a deal with my hobby shop man, and had the first one in the door. Here it is, for your inspection. This armored apple of my eye came about from a need in the French Army for a new infantry support vehicle, , based on a 75mm gun that could fire high explosive rounds. This was to be mounted on a Great-war style trench crossing chassis, in the hull. Afterwards, the possibility of armored opposition was addressed by the addition of a turret mounted 47mm gun. Originally, this was the short model 47mm, the engine being 180 h.p. 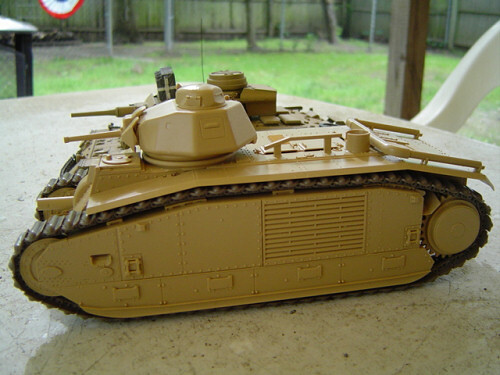 Armor was 40mm front and sides, already giving a powerful tank for the 1930's. 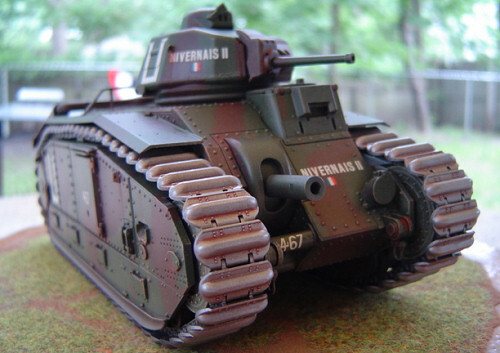 These first 35 models were the Char B 1. But more was already on the way, German aggression spurring the addition of a more heavily armored APX4 turret with a long, high velocity 47mm gun, and up-armoring to 60mm front and sides. This required up-engining to a 307 h. p. engine. 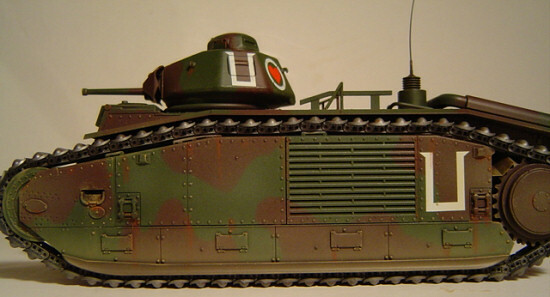 This was the Char B1 bis. All this reduced range to 87 miles, which would cause problems later, in the fast moving Blitzkrieg. 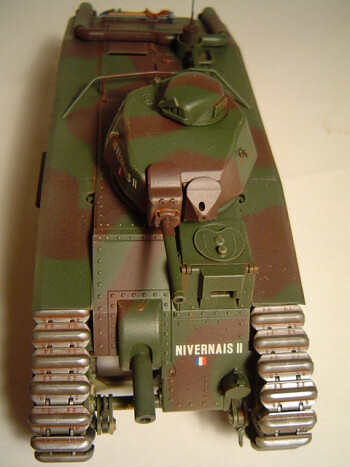 By the time of the German onslaught in 1940 about 300 of the various models were in service with the four French armored divisions, and some independent units. For 1940, the Char B was truly formidable compared to it's opponents. It's 47mm turret gun was effective, the 75mm could be trained by a sophisticated Naeder Hydrostatic transmission for fine aiming. 60mm of armor was at least 3 times as thick as a Pzkw. IV, impervious to the 37mm guns of the German vehicles and Pak guns. However, these points were outweighed by some damning disadvantages. The APX4 turret had room for one man. This "Commander" had to: find targets for the 47mm and 75mm guns, load and fire the 47, give orders to the rest of the crew, and, if a squad leader, issue orders to the rest of the group! (almost forgot, the co-axial machine gun was in the turret, too) This before multitasking became accepted. In the heat of battle, this was one overloaded boy! By comparison, the Panzer 3 and 4 had 3 man turrets, with good division of labor. Speed was slow, and as mentioned before, range short. I had always heard the cooling grille on the left side was a weak spot, now I've heard it wasn't that vulnerable. At any rate, when the Nazis encountered these monsters, they were in for a shock. Tamiya includes in the kit a marking sheet, on the flip side of which is a history of the battle at Stonne, where the 3rd French Armored division did the nasty to the German 10th Armored division, destroying 15 tanks and S.P. guns among the fine hedges and courtyards of a mansion. Individual names are mentioned here, comparing the French company commander to Micheal Wittman! In the end, however the tactical German superiority won the Battle of France. Many of the French vehicles were caught in the chaos of French roads, bombed by Stukas, or caught in the flanks by imaginatively used 88mm Flak guns. After the battle, remaining Char B's (Chars B?) were utilized by the conquerors. Some became turret-less training tanks, others had their 75mm guns removed and replaced by flamethrowers, to become PzKpfw B1 bis (f) Flamm. A few chassis had 105 howitzers mounted on them, to form a weird high mounted S.P. gun. Some even ended up back in French hands after the D Day invasion. Inside the large box with nice box art, you'll find five sprues, plus hull molding, a bag 'o track links, and a bag with a piece of real chain to hang on your rear hooks. Ah, yes plus the all-important poly caps. A nice French multitasker figure is also included, looking spiffy with his puttees and pistol. No sink marks are in evidence, and no ejector pin marks are on any parts that can be seen when assembled. 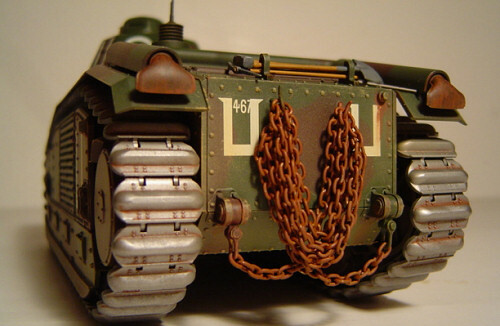 The entire rest of the kit can be assembled, and the tracks painted and installed very easily at any time, thanks to the poly caps in the idlers and sprockets. Once installed the tracks and wheels turn as smoothly as any Corgi diecast do, without falling apart. Bee-ootiful! The only addition I made was to install a piece of clear plastic behind the open drivers visor, to represent armor glass (I assume it had one). All hull pieces snicked together, no filler anywhere. The two turret halves left a small seam, so I took a brush and some MR. Surfacer 500, and simulated a weld. I left off the tools, chain and antenna guard to facilitate masking, and repaired to the paint shop. I hear a lot of people say they don't like Tamiya decals, saying they are too thick. I , again, have no problem here. They go on nicely with Solvaset, the carrier film disappears with another coat of Sealer. This color scheme has big letter "U's" on it, and some neat Hearts in circles on the turret. I then Drybrushed the whole deal with Sand Yellow, after which the lower areas were sprayed lightly with the same, finished up with Floquil railroad colors "Foundation," for a very light overall dust coat. Sprocket teeth and wear plates weathered with aluminum, some random rust streaks and Viola! Fin! All that was left to do was attach the left off parts. On the rear deck is a rail across the engine deck. I've never seen a reference to this, I assume it's a guard to keep the 47 from depressing too much and blowing a hole in it's own engine. Tools were painted and put on the racks in back, an antenna made and put on. Following the plan's suggestion, I primed the chain before painting it rust, and wrapped it around it's hangers a' la the detailed instructions. What appears to be 4 large jacks are included, and the instructions indicate putting them on the fenders. I could find no pictures that included these, so decided to leave them off. It's been a long time since I enjoyed a kit like I did this one. The engineering and fit makes it a pleasure to do. $52 bucks is kind of expensive, But at least to me it's worth it. Building right out of the box allowed me to avoid the dread AMS (Advanced Modeler Syndrome) this time. After a wait of 30 years I finally have my Char Beast. Anyone with any modeling skills can build this one and have a Beauty. I know it's not as Hyperdetailed or loaded with extras as recent Dragon kits, but I'm sure we'll be seeing some after-market goodies coming out for this, and will see some superdetailed masterpieces. I would recommend this model to All.